It is produced from high quality virgin high density polyethylene (HDPE). It comes in different sizes. These are usually displayed in a dispenser pack providing you with convenience and ease of access while on the counter top of any shop. Dispenser | Freezer Bags Natural 9" x 6"
Dispenser | Freezer Bags Natural 10 X 8"
Natural- 250mmL x 200mmW- 1000 per pack- 10 packs per carton. Carton of 10000 bags. 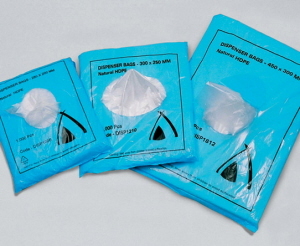 Dispenser | Freezer Bags Natural 12" X 10"
Natural- 300mmL x 250mmW- 1000 per pack- 10 packs per carton. Carton of 10000 bags. Dispenser | Freezer Bags Natural 15" X 12"
Natural- 375mmL x 300mmW- 1000 per pack- 10 packs per carton. Carton of 10000 bags. Natural- 400mmL x 250mmW- 1000 per pack- 10 packs per carton. Carton of 10000 bags. Dispenser | Freezer Bags Natural 18" X 12"
Natural- 450mmL x 300mmW- 1000 per pack- 10 packs per carton. Carton of 10000 bags. Natural-Heavy Duty- 375mmL x 300mmW- 500 per pack- 10 packs per carton. Carton of 5000 bags. Natural- Heavy Duty- 450mmL x 300mmW- 500 per pack- 10 packs per carton. Carton of 5000 bags. Natural- Heavy Duty- 600mmL x 450mmW- 500 per pack- 4 packs per carton. Carton of 2000 bags. Natural- Heavy Duty- 970mmL x 560mmW- 500 per pack- 2 packs per carton. Carton of 1000 bags.